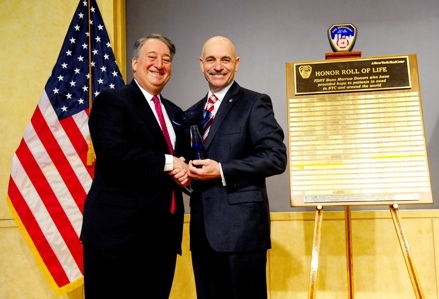 Fire Commissioner Salvatore J. Cassano, Christopher D. Hillyer, M.D., President and CEO of New York Blood Center (NYBC) and Howard P. Milstein, Chairman of NYBC’s Board of Trustees, joined today to add the names of the 2010 FDNY bone marrow donors to the “Honor Roll of Life” at the seventh annual induction ceremony at FDNY Headquarters. During the ceremony, Lieutenant Firefighter Michele Fitzsimmons, 41, of Engine 67 in Manhattan; and Firefighter Owen Fay, 32, of Engine 33 in Manhattan met the recipients of their life-saving stem cell donations – Michael Wolak, 48, from Brighton, Michigan; and Luca Campana, 5, from Pearland, Texas. In June of 2009, Lieutenant Michele Fitzsimmons donated peripheral blood stem cells to Michael Wolak, who was diagnosed with Myelodysplastic Syndrome, a group of disorders caused by poorly formed or dysfunctional blood cells. As a result, the bone marrow makes reduced numbers of red blood cells, white blood cells, platelets or any combination of the three. After several blood transfusions and several monthly injections at his doctor’s office, Michael was referred to Karmanos Cancer Institute. He underwent several more tests and was told that he would not live beyond two or three years without a bone marrow/stem cell transplant. On July 1, 2009, Michael received Firefighter Fitzsimmons’ donated stem cells. The transplant was successful and Michael and his family can look forward to a long future together. Michael was accompanied to the ceremony by his wife Judy, their 18-year-old daughter Kelly and 16-year-old son Christopher (who survived leukemia in 2007). Lieutenant Michele Fitzsimmons followed in her grandfather and great grandfather’s footsteps and joined the FDNY in May of 2001. During Lt. Fitzsimmons’ last week at the Fire Academy in June 2001, she joined the Be The Match Registry along with all the members of her class. In February of 2007, she was promoted to Lieutenant, and two weeks later her sister Maura graduated from the FDNY Academy. That same year, Lt. Fitzsimmons co-founder the Phoenix Firecamp, a weeklong overnight camp based in Utica, NY for teenage girls interested in a career in the fire service. Today, Lt. Fitzsimmons is one of six female officers in the entire FDNY and is the FDNY’s first female bone marrow donor. 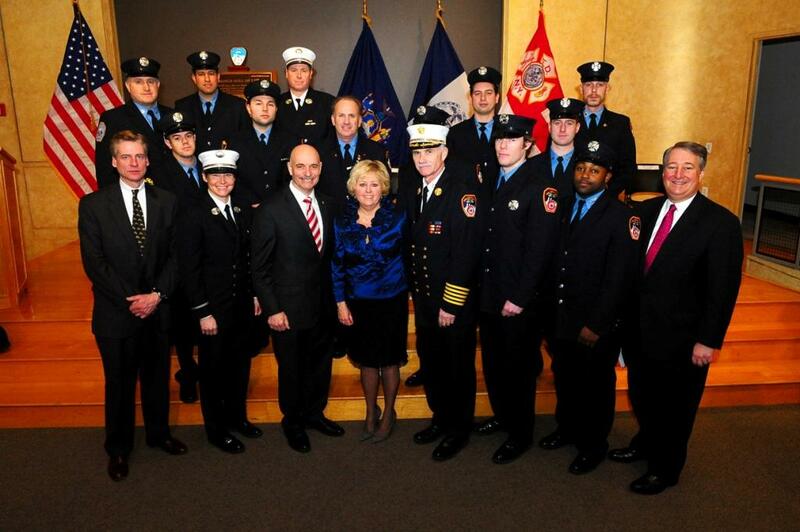 Participants in the seventh annual Honor Roll of Life induction ceremony at FDNY Headquarters. (Photo by Chris Herder) Firefighter Owen Fay graduated from the FDNY Fire Academy in September of 2004, and like all of his classmates, he joined the NYBC Bone Marrow Registry. Firefighter Fay did not know at the time that his simple act of registering would one day save a life, and that the person he would save had not yet even been born. Nine months later, Luca Campana was born in Pearland, Texas. Firefighter Fay donated bone marrow to Luca in January of 2009. Luca, a rambunctious 5-year-old boy who loves video games, was diagnosed with Acute Lymphoblastic Leukemia in April 2008. He was taken to Texas Children’s Hospital where over the next 8 months; he received 12 spinal taps with chemo, countless Bone Marrow Aspirations, 56 doses of IV chemotherapy, and daily chemo pills. Although in clinical remission, the doctors stressed that he was at a high risk for relapse. If he relapsed, the doctors mentioned that they would not be able to get his cancer back into remission and recommended that he proceed with a bone marrow/stem cell transplant. Luca’s parents and sister were not a suitable match. His only hope was to find an anonymous donor on the Be The Match Registry. Fortunately, there was a perfect match for Luca. On January 16, 2009, Luca was transfused with Firefighter Fay’s donated bone marrow. Luca was released 7 weeks later, but continued to return to the hospital as he fought various illnesses resulting from his bone marrow transplant including a breakdown of his red blood cells and platelets (a condition called thrombotic microangiopathy or TMA), which were being transfused to Luca three to four times a week. Luca then needed another transfusion of stem cells from Firefighter Fay, which he gladly donated a second time. Luca received Firefighter Fay’s second donation of peripheral blood stem cells on February 26, 2010. His cell counts improved and Luca has not had another transfusion since March 2010. Today, Luca is a normal healthy 5-year-old boy who started Kindergarten in September 2010. His older sister Hailey is happy to have her brother back. Luca continues to make new friends while being a source of inspiration to those who meet him. Luca was accompanied to the Honor Roll of Life ceremony by his parents, sister, and grandparents. Members of the FDNY make up New York Blood Center’s single largest group of bone marrow and stem cell donors. To date a total of 134 firefighters have given these gifts to patients – in some cases more than once – accounting for 13 percent of all donors from New York Blood Center. NYBC will present the FDNY with an award acknowledging this extraordinary commitment to saving lives in our community. FDNY encourages its members to donate blood and other blood products, such as platelets, bone marrow and stem cells. Its bone-marrow-donation partnership with NYBC began in 1990. Over the past twenty years, the FDNY has become the single largest group on NYBC’s bone marrow registry with more than 8,000 FDNY members on the donor list. Probationary firefighters are encouraged to sign up for the bone marrow registry during their training at the Fire Academy on Randall’s Island. In the past six years, nearly every probationary firefighter has participated in the program.